Visit the Detroit area event page for participating restaurants and more! Dining Out for Life is a great way for your restaurant to be philanthropic in the community in which you live, work, and play for ONLY ONE DAY A YEAR. In 2017, over a dozen restaurants and sponsors came together to participate in Dining Out for Life that raised over $8,500 to provide life-saving services to people living with HIV/AIDS in Michigan through a program offered by Matrix Human Services. Because of your commitment to Dining out for Life, Matrix Human Services’ Community Health division will help to provide HIV and STD testing, counseling, prevention and risk reduction services and referrals for persons living with HIV in and around the Detroit area. Your help will assist with services to more than 5,000 people in 2018. Dining Out For Life will help to build your restaurant’s brand as a community driven business in your area because you have signed on to help this important health cause. 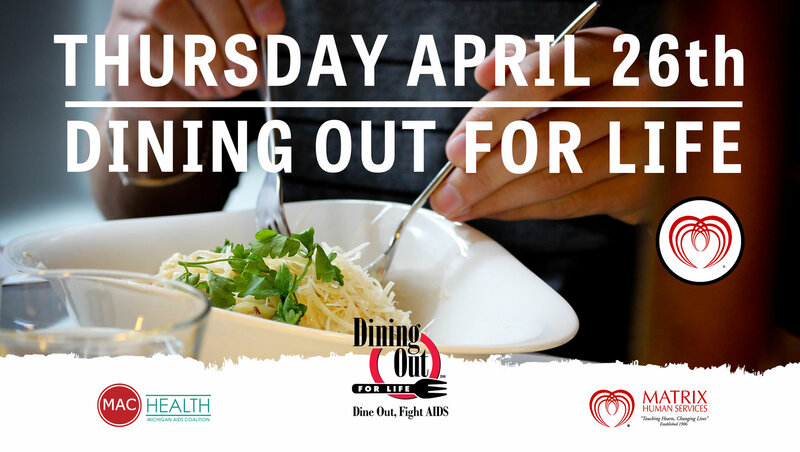 Join other top Detroit area restaurants for Dining Out For Life on Thursday, April 26, 2018. Your only commitment is to donate 35% or $500 (whichever is greater) of food and beverage sales on April 26th to Matrix Human Services’ Community Health Division. The 35% or up to $500 dollar commitment (whichever is greater) will truly make a difference for the clients we serve to slow the spread of HIV. In 2017, there were over 11,560 HIV positive diagnoses in our metro Detroit area. In return, Matrix Human Services will promote your restaurant in print materials, our newsletter database of over 6,500 subscribers, social media pages of over 8,000 fans and followers, and website Dining Out For Life landing page. Restaurants that commit to higher levels of $1,000 or more will receive traditional media exposure by being included in press releases, obtained TV, radio, and print interviews as well as community and influential business leaders (Matrix ambassadors that include board members of the organization) that will patronize your restaurant with their networks of friends on Thursday, April 26th. Dining Out For Life garners significant media attention each year. In 2017, media sponsors included Fox 2 News in studio interviews, Hour Media, with featured coverage appearing in Between the Lines newspaper – PrideSource.com. In 2018 we anticipate even greater media coverage.